We create useful stuff for bloggers and online creators. Honestly, the only reason this site exists is that we created the Blogging Planner for ourselves to help with our own blogging struggles. Over a couple of years, we refined it and became obsessed with it. It changed the way we work and we couldn’t imagine our life without it. We knew it would help other bloggers and online creators too, so we really wanted a way to share it and create a community so we can help each other. Thus, The Line We Live On was born. For showing up every day. For putting in the work knowing it will take time before you start to see results. For being brave enough to take a different path. For knowing that it’s the small things that create the big picture. For working to achieve your dreams. For continuing despite the challenges. We are Mandy and Chris, creators of The Line We Live On. But first, creators of two travel blogs, Almost Landing and Almost Landing: Bali. We are obsessed with blogging. We are in love with blogging as a business and creating online. As corny as it may sound, we genuinely wake up every morning so excited to go to work (aka usually the dining room table of an Airbnb somewhere in the world). Blogging and online business is such a beautiful, amazing job, and we are so thankful every day that this is what we do. But blogging is also one of the hardest things we have ever done, in the best possible way. If you’re a blogger or online creator, then you know that blogging is another word for ‘1000 jobs rolled up into one’. And that’s part of its charm. But it also makes it hard. And despite how much information there is out there on blogging, it can still feel so unstructured, wild and complex. 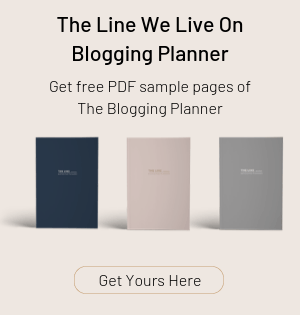 We created The Line We Live On Blogging Planner from our own personal struggles with our own blogging business. Blogging is this entire world of possibilities. Although there are foundational tasks that need to be done, the possibilities of how you choose to produce content, promote your content, and monetise your business are almost endless. It’s probably true that if you have a blogging business or any type of online business, it’s easy to feel overwhelmed, or at the very least, unorganised without a system to make the most of your time. The Line We Live On Blogging Planner is that system. Well, for anyone who is a blogger or an online creator, I’m sure you can relate when we say that you no longer have the 9 to 5 compartmentalised work/life situation going on. 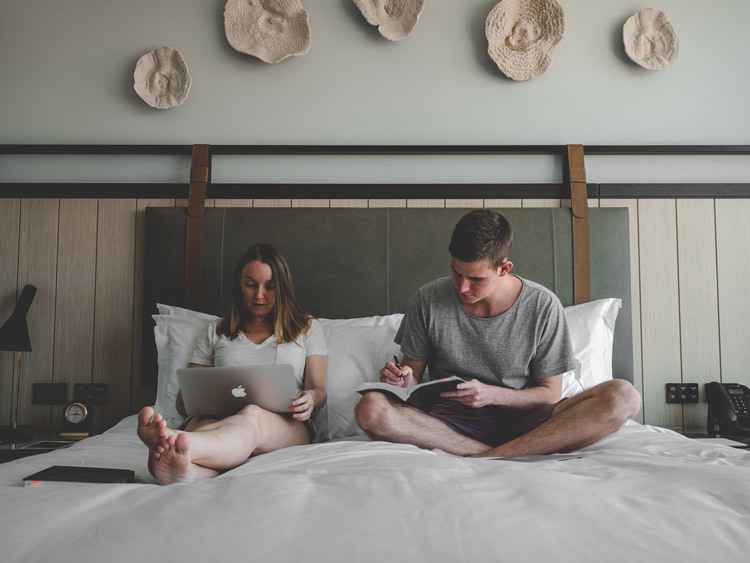 Work and life merge together, and creating online becomes such a huge part of your life… we create, earn and basically live online in some way or another. Sometimes being an online creator can feel like you’re living in this alternate universe, often misunderstood and misrepresented. The Line We Live On is that universe, where we can all relate to this beautiful way of living and creating.